A pretty cool action movie, packed with cliched gangster characters, but some very fun visual effects. This movie is a fun, campy B movie film all the way, and never tries to be anything more. That’s both a good thing and a bad thing. As far as the goofy fun and colorful action with great, yet ridiculous effects, this is all terrific. As far as the story, which never really goes anywhere other than the usual revenge flick where a hero comes back from the dead to go after his killers, the plot never really amounts to much. That’s okay though because the style is so superior to other versions we’ve seen before that it keeps you entertained even While watching such a familiar story. the action isn’t anything special here, but it helps that there are such talented actors involved with Liam Neeson and frances McDermont playing the leads. It’s not a great movie or anything, but Darkman is still some pretty cool fun, just as long as it’s not taken seriously. Darkman is a very simple movie with a very simple story. That’s okay though, because what this movie lacks in its plot, it makes up for with action, effects, and tone. This is a total Sam Raimi film, meaning it is campy as hell, and the entire better because of it. The hero is a regular guy who is pushed to the limit, not unlike Ash (Bruce Campbell) the main character in Raimi’s classic films, The Evil Dead movies. 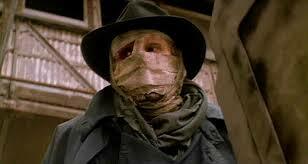 Darkman is absolutely a b movie and very proud of it. This movie never strives for anything super intelligent and deep. Instead, it is content to be solely about having fun. The Coen brothers were good friends with Raimi at the start of their careers, and even took part in some of his movies, including a movie called Crimewave and also this one. Crimewave was a very cheap and silly movie, made with such an independent quality that it almost felt like David Lynch’s Eraserhead. 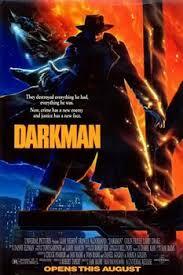 Darkman is more of an effects driven action movie, but like Crimewave, it’s not all that intelligent. The Coen Brothers are of course geniuses, and it seems like working with Raimi was their internship before they were ready to break out and show the world what they could do. Darkman is about a scientist named Peyton (Liam Neeson), who is in a relationship with a woman named Julie (Frances McDermond, the wife of Joel Coen.) Peyton works in a lab every day trying to perfect a skin like substance that he can use to replicate any face and any surface. He can make the most perfect masks with just one problem. They don’t last more than an hour. After that, the material of the mask starts melting and falls apart. Julie, meanwhile, works for a real estate conglomerate that is constructing buildings right outside his window. This man has a dream of an empire and really wants to be the next big mogul. The only problem is he’s doing things illegally. Julie stumbles on some paperwork that shows this and her boss, Louis, tells her she should just forget what she saw, before this knowledge puts her in danger. Only Julie doesn’t listen to him. She brings the blue prints home of the conspiracy she has uncovered, and shows them to Peyton. He takes them into work with him the next day. That’s when the bad guys show up and go after him. Realistically if Julie was the one who stumbled upon the information she wasn’t supposed to have, then the bad guys would probably kill her, and not go after her husband. Still, the movie needs Peyton to get disfigured and so it passes the buck to him, giving him the contracts that would make the villains come after him. They show up at his lab one night, led by a heavyset man named Mr. Durant, and they kill Peyton’s partner. Then they take Peyton and throw him in an acid tank, burning his face off. The lab explodes and somehow Peyton survives. Only he is incredibly disfigured. Good thing he invented a way to make a perfect mask that replicates someone’s face in exact detail. If only it wouldn’t start melting. Now Peyton goes after the guys who did this to him. The revenge story is very clichéd at this point. There’s even a subgenre of it called the revenge by a person who was thought to be dead. Whether it’s Thomas Jane playing The Punisher, Tarantino’s Kill Bill, The Crow, or Bruce Lee in Game Of Death, this type of movie has been done again and again, but it still works when done correctly. The thing is that each movie needs to add something new that the others haven’t done before it. Each movie needs its own style and specialty. The good news is, of those four films, each one has it. Kill Bill is certainly unique, being about a former assassin going after her assassin team. The crow is great because of it’s black as night, always raining atmosphere. Game Of Death is terrific because Bruce Lee is in top form. And Darkman is just loaded up with cool and campy effects. This stuff doesn’t look real at all, and that’s totally fine. The explosions and rapid montages that mix in fire and madness at warp speeds feel very comic book-like, and it’s pretty clear from this movie why Raimi was chosen for the spider man films. Like those movies, this one might be called Darkman, and about a bleak subject matter, but it is still loaded up with color and energy. Say what you want about Raimi’s Spider Man movies (I don’t exactly love them myself), but he definitely gave the studio exactly what they were hoping for. Darkman is one of those movies like The Evil Dead 2 where you can tell that Raimi was in total control. He wasn’t out to make anything great here, but just trying to have some big budget fun. this was certainly the most expensive movie he ever got his hands on, and while the film doesn’t stand out as anything terrific, it certainly shows off Raimi as a master of style. if the story had been a little more creative, this could have been a far better film. Instead, the story is composed almost entirely of moments we’ve seen before, but it’s the action and style of Raimi that make this film feel unique.